Sustainability the key to the Groat family’s Devernick Dairy business near Aberdeen. Angela Calvert reports. THE Groat family have invested heavily in their Devenick Dairy business over the last four years but money has been spent wisely, with much of the work being done by themselves using second-hand or recycled materials and equipment. 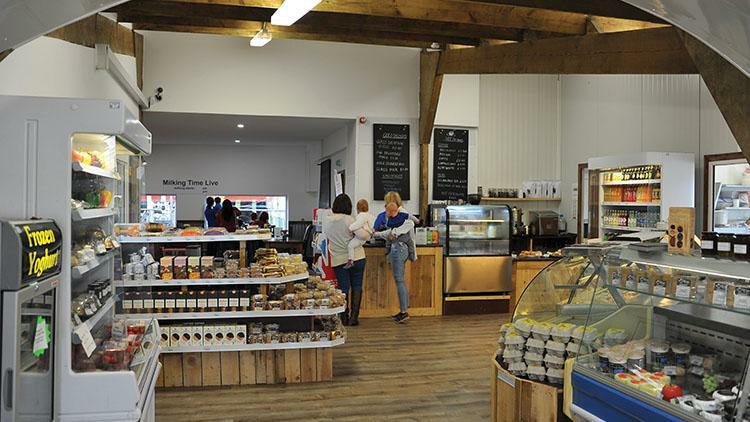 The result is the relocation of the farmyard and a refurbished farm shop with large cafe, rebranded as the Tin Coo, which overlooks the newly installed milking parlour allowing the public to watch cows being milked. But this is only part of the story, in addition to the on-site retailing operation, the bulk of their huge range of cheeses are sold to numerous hotels, restaurants, delicatessens and farmers’ markets, as well as online. Kenny Groat who runs the business at Banchory-Devenick with his father, Richard, and brother, Ian, says: “Making cheese was the start of our diversification 10 years ago. My grandfather came here from Orkney 65 years ago starting with six cows and growing the herd to 200 which over the years. “But the business was not big enough to support my brother and I when we returned to the farm after college and travelling. We wanted to do something different and decided cheese was the way to go. Initially, yoghurt and soft cheese was made with Richard as head cheesemaker, a role he still holds although now with assistance while Kenny is in charge of the retail and marketing side while Ian manages the cows. Kenny says: “Soft cheese is quicker to turn round which is why we started with them but, keen to do something different, we are constantly trialling and experimenting new cheeses. 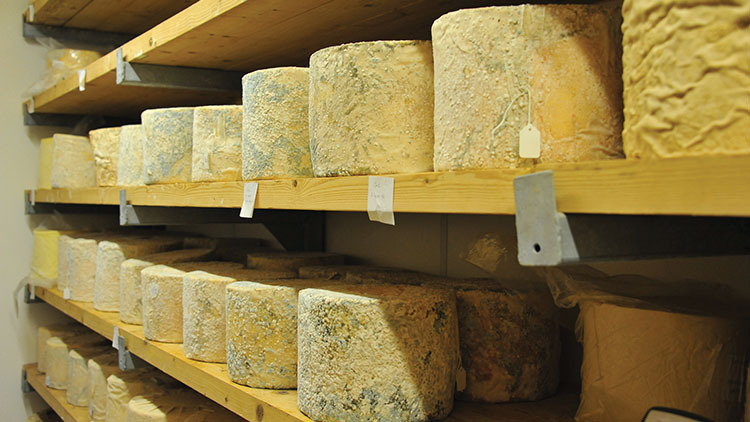 Now we have a range of about 16 cheeses including cheddars, blues and Bries, focusing on traditional styles with a modern twist, meaning we are able, for example, to supply a restaurant with their whole cheese board. We deliver by van in about a 120-mile radius of the farm. In recent years, cow numbers have been reduced to about 120. Kenny says: “We run Friesian and Jerseys and the family have always operated a New Zealand-style system with cow tracks and paddocks long before anyone else in the area did. “When we started to diversify we lost some focus on the farm. I think thishappens to a lot of people when they start a new enterprise but now we are looking to get things back on track in terms of management and efficiency. The herd is in the process of moving completely to spring-calving with the aim eventually no cows will be milked in December. The cows are giving 7,200-7,900kg daily without being pushed and about 58 per cent of the milk is processed on-farm and the remainder sold to Muller. 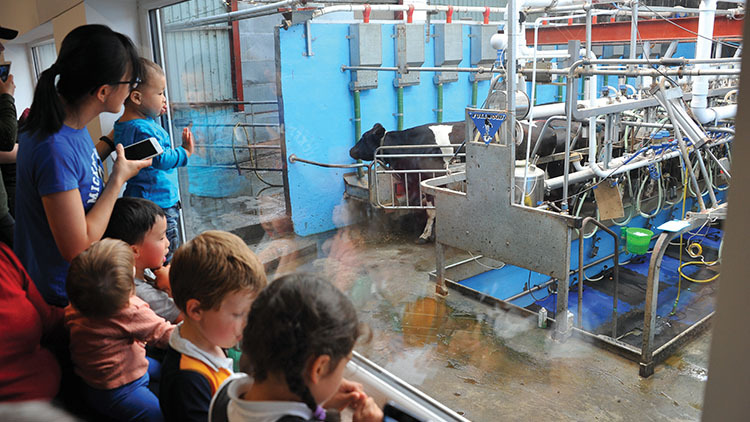 The dairy has the capacity to handle 6000 litres of milk a day for cheese. Pasteurised but not homogenised milk is marketed as ‘Free Range’, sold in the shop and used for the coffee. At one time the butchery was franchised out but this has now been taken back in-house with both Kenny and Ian able to butcher, although Tom Craigmile is now employed as they do not really have the time. 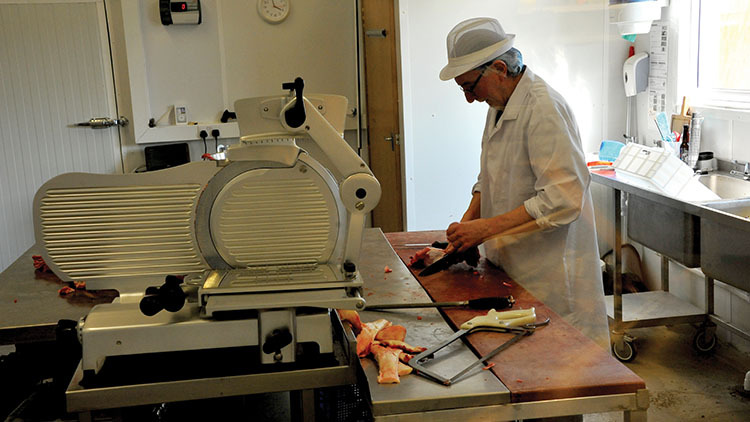 The butchery produces half a tonne of sausages a week in a range of flavours which again ensures no meat goes to waste and none needs to be frozen. 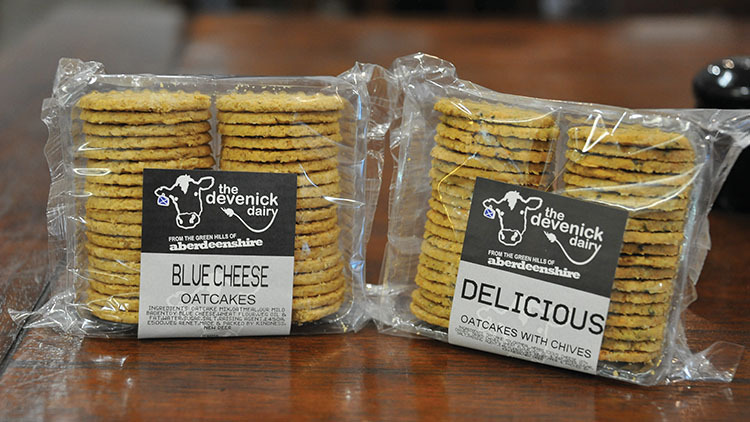 Devenick Dairy is also well known for its award-winning oatcakes which are made locally using any offcuts of cheese. There are also 26 varieties of ‘proper’ cheesecake produced for the shop and cafe and for food service and retailers, with Orkney Fudge a bestseller. In another move towards total self-sufficiency, a wind turbine provides electricity for the cold stores and two biomass boilers heat the water for all the dairy processing as well as three houses on-site. The dairy attends trade shows and food events and regularly competes in the dairy products section at the Royal Highland show where they will be exhibiting a full range of cheese again this year under their rebranded packaging. The family have been pleased and a little surprised at how well the new cafe with view gallery has been received. “It is proving to be a real draw in the area and even people you would not expect are interested to see the cows being milked, but we are the only dairy farm left in the region. We have not invited school parties yet but this is something we hope to do in future.